The Detroit Tigers offense isn't the only thing firing on all cylinders! Rob Rogacki and HookSlide are back for another week of The Voice of the Turtle, breaking down the first full week of the 2016 season. 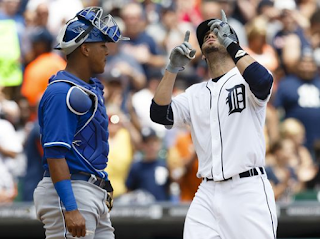 The Tigers have gotten off to a hot start, winning six of their first eight games -- including matchups against aces Jose Fernandez and Gerrit Cole -- and the numbers behind those wins look even better! They have scored at least four runs in every game and the bullpen looks (gasp!) passable, if not better. We also look forward at the upcoming week of action, including a showdown with the red-hot Kansas City Royals. The Tigers have some decisions to make about their starting rotation, but their upcoming schedule doesn't get any easier no matter how you slice it. There's also some prospect talk mixed in, including Rob's complete inability to pronounce the name "Jose Azocar." But the best part? Brad Ausmus hasn't raised HookSlide's blood pressure through the first eight games, a prop bet everyone would have gone way under on before the start of the season. Click to here to subscribe to the podcast on iTunes! Be sure to rate and review the show as well! Be sure to send your thoughts, suggestions, and questions for our next show. We're on Twitter at @hookslide23 and @BYBRob!